Experience your inner peace, positive health, and happiness. 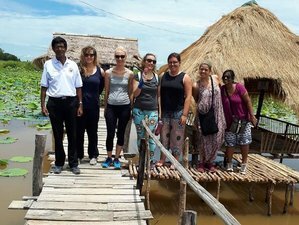 Experienced yoga teachers, yoga therapist, and Ayurveda dietitian will guide you to have a healthy relaxing holiday in this yoga retreat in Cambodia. Experience the transformation taking place in your system during the yoga and meditation sessions. Get rid of your physical, mental stress, and your health problems through yoga therapy and meditation. During the training course you will be accommodated at Himalayan Yoga Retreat and Ayurveda Center. You will be staying at a comfortable accommodation with a beautiful yoga hall, and air-conditioned rooms. Learn to meditate in a systematically simple way during the meditation sessions. Enjoy the Aqua yoga in the swimming pool. Understand the concept of yoga, the concept of yoga therapy mindfulness yoga, and meditation during the daily practices and lectures. Detox is the short term for Detoxification. Detox process has different stages. First improving the natural way of removing toxins and waste from the body. Detox programs can help the body's natural cleansing process. Liver, kidneys, lungs are the main organs which are involved in removing waste from your body. By maintaining all these organs healthy, through practicing authentic yoga techniques including Asanas, breathing exercises/ pranayama, meditation etc. The elimination or detoxification process is done at the optimum level. Next by eating and drinking proper healthy food you can reduce the production of excess toxins in your system. By eating wrong unhealthy food and eating excess food more toxins are produced in your body. You can also keep your kidney, liver and lungs clean and healthy and give rest to these organs, by avoiding unhealthy food and drinks such as smoking, alcohol, excess fat, excess sweet, etc. You can also keep these organs healthy by eating and drinking healthy Satvic Yogic food and Ayurvedic food which will not produce toxins in your body. Ayurveda and yoga, both ancient Indian health and wellness systems specialize in detox programs through yogic Satvic diets, Ayurvedic diets, Kriyas/cleansing techniques, purification therapies, Kapalabathi, Herbal food and drinks, Asanas, Pranayama, Meditation, Trataka etc. which Himalayan Yoga Retreat and Ayurveda Center are offering regularly. The Aqua yoga will be held at a nearby hotel's swimming pool. On one of your retreat days, there will be a visit to lotus farm and mountain. There will be also yogic meditation walks. Ms. Bhawani has traveled widely in Europe and Asia teaching yoga, Indian cooking, and Ayurveda massage therapy. An expert in cooking Indian traditional food and yogic or Satvik food, she is also specialized and expert in menopause, pregnancy, and children yoga. She is a certified yoga teacher from International Sivananda Yoga Vedanta Center. This Cambodia Yoga Retreat Center is located in the temple city of Siem Reap, Cambodia. The Yoga Retreat Center is close to the world famous Angkor Wat Temple - .5 kilometers from the Retreat Center. The price of this retreat includes daily healthy breakfast, detox juice, and lunch. All meals are vegetarian. Please book your flights to arrive at Siem Reap International Airport (REP). Transfer from this airport is included. Himalayan Yoga Retreat and Ayurveda Center will pick you up at the airport.